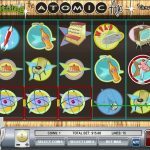 Atomic Age is a 1950’s slot machine game from Rival. So if you’re a fan of the era like I am please continue reading. If you think this is all about atomic weapons and you get to explode nuclear bombs then that’s not the case here. 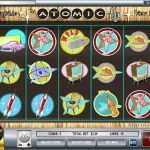 Atomic Age slot is using 5 reels / 15 lines and unlike the infamous free spins you get everywhere, in Atomic Age you get to pick from two “pick-a-box” bonuses, which I think is very refreshing and fun! There are multiple bonus options here. First, the UFOs can replace any game symbol to create a winning combination. They can also create instant wins of up to 7500 when multiple symbols appear on a play line. You also have scatter symbols which are a Cash Register and a Car. These will trigger the Cash Register Bonus and the Drive In Bonus where you could win up to x50! 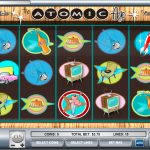 Atomic Age is fun and refreshing with a great graphic that represents the 1950s and with a good paying jackpot. There are no free spins but the multiple bonus options over compensate that fact I believe. Love 5 reel slots? Try Tycoon Towers, a 5 reel slot by Rival.